If you've been reading my blog recently, then you may have already guessed that I'm a pretty sentimental person, especially when it comes to being a mom. A good book or movie will also get me to shed a tear from time to time. When I recently received Forever My Little Boy, I knew it would tug at my heartstrings–I just didn't realize how much. All the sweetness, challenges, and thrills of parenting are lovingly shared in this heart-touching poetic short story by bestselling fiction author Karen Kingsbury. From first steps to T-ball games, riding a bike to driving a car, a lifetime goes by in the blink of an eye. This book celebrates all the ups and downs of parenting a little boy and will be a cherished keepsake for any parent. Karen Kingsbury is a top inspirational novelist, and she imbues both nostalgia and inspiration in this sentimental book for parents of boys. This book offers a short story paired with prayers and Scripture about how quickly time goes by and the special bond between a mother or father and son. As soon as I discovered Forever My Little Boy, I knew it was one that I had to check out. Anything that's going to celebrate motherhood, parenting, having a son, or all of the above is one that I simply couldn't pass up. The story begins with a mother and father telling the story of their son's life. The book basically takes you on a journey from birth and on, touching up on the many milestones of their little boy's life (those first steps, first day driving, and even his first girlfriend). 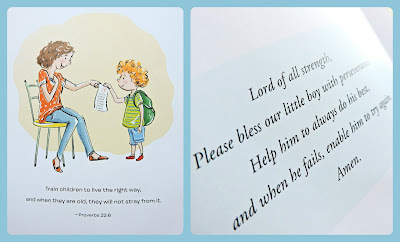 Throughout the pages you'll also find Bible scripture references and even endearing prayers to recite. The book is about 58 pages long, but it is a very quick read. Actually, it's very short and sweet with a minimal amount of text on each page. I must warn you the ending is an extreme tearjerker. Even though this isn't necessarily a book made for children, there are some cartoon illustrations in it, so I sat with my little boy on the couch and read it to him. When I got to the end, the waterworks decided to make a grand entry and let me tell you, it took a while for them to stop. My son being only a toddler got a kick out of it and thought I was kidding around, but then gave me a big hug and kiss, which of course made me cry even more. Later that night when I told my husband about the book and mentioned the ending, I started crying again–just thinking about it made me so emotional. If you've already read this book, then you know exactly what I mean. If you haven't, I won't give too much away. My word of advice is to have a box of tissues standing by before you begin reading. Even though my son is only two, it's not hard for me to imagine myself in the shoes of the mother in this book. He is growing up so quickly, and reading this made me realize that even more. Not that it's a bad thing...just watching him grow up is a amazing thing–it's just very bittersweet how fast the time goes. 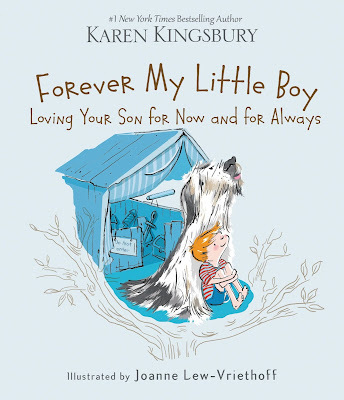 Forever My Little Boy is a very heartwarming story and one that would make a wonderful gift to parents with children of any age and even to an older son as a dedication of their life. The author has even released a daughter version of this book, Forever My Little Girl, which I haven't personally read, but could only imagine is just as beautiful. If you have a son, then I definitely recommend giving this a read. No matter his age, it'll be sure to make an impact on you.